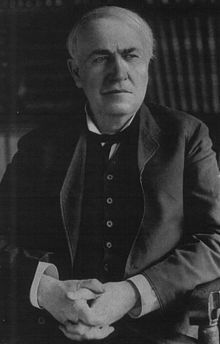 American inventor Thomas Alva Edison was born in Milan, Ohio on February 11, 1847. He was the youngest of seven children and received little formal schooling. Most of his education happened at home under the care of his mother, Nancy. When he was young, Edison suffered from a bout of scarlet fever that left him with permanent hearing problems. In his late teens he was trained as a telegraph operator by a thankful station master whose son Edison had saved from being run over by a train. At the age of 24, Edison married Mary Stillwell. Together they had three children, Marion (nicknamed "Dot"), Thomas Jr. (nicknamed "Dash"), and William before Mary died in 1884 from a brain tumor. He later remarried to Mina Miller who gave birth to Edison's younger children, Madeleine and Charles. Edison possessed extensive entrepreneurial skills which led him to found more than a dozen companies, among them General Electric. His first patent was for inventing an electric vote recorder. However, the device was a commercial failure. It wasn't until he created a highly improved stock ticker that Edison began to make money from his inventions. His most famous and successful inventions, many of which were developed in his personal laboratory at Menlo Park, include the phonograph and the incandescent light bulb. Thomas Edison died at the age of 84 on October 18, 1931. At his time of death, he held more than 1,000 U.S. patents in his name. In 1983, Congress designated Edison's birthday as National Inventor's Day.